Consistent care is key. Give your grass the lawn care and seasonable treatment it deserves. We recommend deep and ample watering of your lawn during inevitable dry spells; the periodic aeration of soil to allow grass roots to receive the upmost water absorption, loosen compaction and direct feeding of nutrients, weekly mowing in season to ensure proper and continued growth and fertilization and weed control applications. We use only commercial grade equipment which is meticulously maintained. Everyone on our crews is trained using all the equipment and is supervised closely. Our blades are sharpened regularly and we pride ourselves on offering the best mowing available. Trimming will make or break the look of the landscape. We are careful to not trim too short or damage trees or property with our trimmers or leave grass sticking up across the sodded areas. Quality edging is an effective and attractive way to separate your garden beds, paving, and other garden features from your lawn. It can give your lawn a more structured look and add formality to an otherwise quite casual or undefined yard. We will edge concrete borders such as walkways, curbs, and driveways during the growing season with mechanical steel blade edges. We blow all hard surfaces such as driveways, sidewalks, patios, decks, etc at the end of each service. We are careful to not blow any debris back onto the newly cut grass or into flower beds. 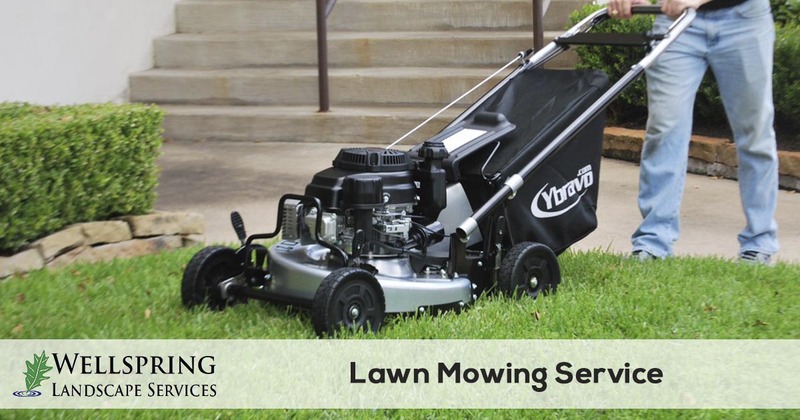 If you are tired of spending your nights and weekends mowing the yard or just need a change from who is mowing your lawn currently, call Wellspring Landscape Services at 512-653-7700 or request a free quote online. We make it easy to schedule your service and have convenient payment options available.